Pets dont like being dirty any more than humans but they hate baths. Now there’s a new way to clean and condition cats and dogs in between baths with the Pet Groom Pro. This revolutionary new pet brush emits millions of safe, cleansing ions that eliminate dander, allergens, and odors as you brush. Best of all, its revolutionary Snap N Clean faceplate removes built up hair from the bristles in seconds. 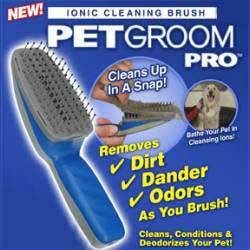 The Pet Groom Pro works for all cats and dogs, whether big or small, long or short haired. And its battery powered and completely silent so even jumpy pets stay calm. Pet Groom Pro is the only pet brush that packs the ionic cleaning technology of todays most advanced air purifiers into a brush that cleans in a snap.